We process only the choicest premium Ghana cocoa beans without any blending. Cocoa Processing Company is probably the only factory in the world which can make such a claim. Through intensive research and product development, we turn out products, which meet international quality standards and also consumer satisfaction. Pebbles comes in an array of rainbow colours and understandably is the toast of many children and adults. Choco Delight is a delicious chocolate spread made from carefully selected ingredients and is a great condiment to bread and pastries. Royale provides the cocoa lover with an unadulterated drink that contains no additives whatsoever, just pure cocoa. 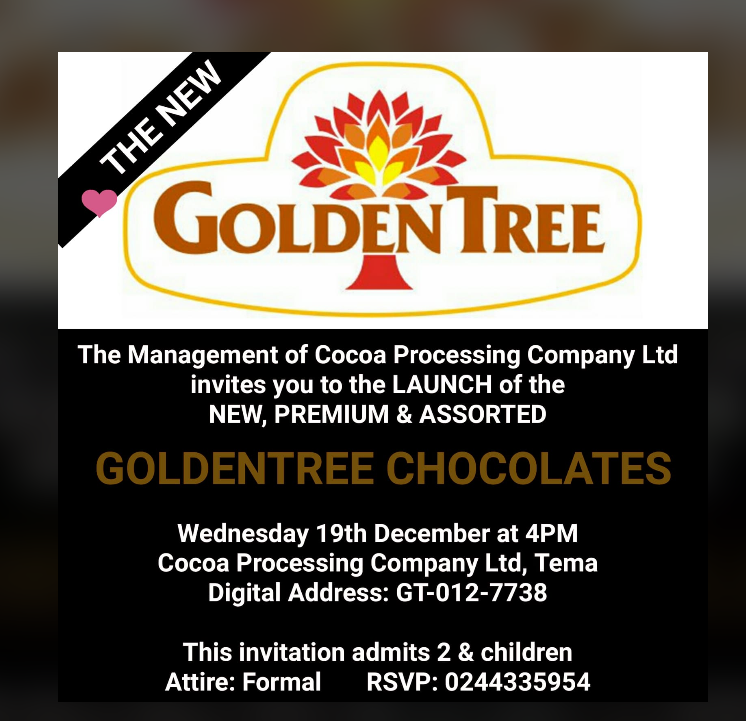 GoldenTree chocolate Couverture comes in two varieties, milk and dark chocolate. Usually in 25kg blocks or 100g bars packed 250 in a carton. The beans are sorted, roasted, winnowed and milled to produce cocoa butter.